Often we are faced with patients that are reluctant to use ANY hair loss products. As long as you understand the consequences that is fine. Here is a good example of a patient that refused taking any anti hair loss products. 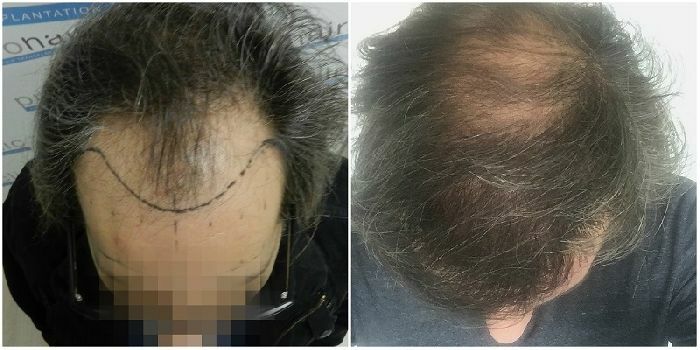 He came to us with only the frontal area thinning and we placed 2500 grafts. 5 years later it is clear to see the transplants are growing fine, however the top and crown area are now balding. Therefore most prominent clinics clearly inform patients about the risks of not taking anti hair loss products. This is an outstanding comparison and really shows the reality of how hair loss is progressive. The flip-flop location of his hair loss is presented very well. It doesn’t get any more clear than this. Well done. The left pic is before 2500 grafts? you see the marker they drew on his scalp in the left pic, that was where they placed the grafts so i think this is pretty clear left pic is before the 2500 grafts.